This salad has so much flavor and textures. I like to serve it with grilled fish or just with an assortment of other salads and vegetables. Especially when I have vegetarian guests, they just love it! Preheat the oven to 425 F. Toss the squash with the garlic, olive oil, allspice, and some salt and pepper. Place on a tray in the over for about 15-25 minutes or until soft. Remove and cool. While the squash is cooking, make the tahini sauce. Mix the crushed garlic with the lemon juice and add the tahini. Thin with the water and olive oil and check for seasoning. You should balance between the nutty tahini and lemon. 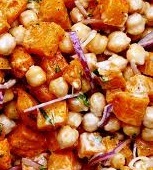 To assemble the salad, place the squash, chickpeas, red onion and coriander in a mixing bowl. Pour on the tahini sauce and remaining oil and toss gently. Season with salt and pepper. Serve warm or room temperature. Looks wonderful -- I'll try it this week! Made this today -- delicious! It's tasty and different from the usual, which I appreciate. Since I had some garlic olive oil, I used that, but otherwise followed the directions. I'll make it again. I'd say it makes more like 6-8 good servings (rather than 4). Also, the allspice is in the ingredient list but not in the directions, but I assumed I should toss it with the squash before baking. I'm so happy you found this recipe delicious! It's one of my favorites as well. My apologies for omitting the ground allspice, it's a very important ingredient, and yes you assumed right! I've become my mother, she used to try to teach me to cook, but I could never get the right instructions from her. "Use your imagination" she would always say. Also, I always make too much food, it's great to have leftovers but in my house, we are such gourmands, nothing is ever left! Still, I keep trying. Now that we are in the height of our tomato season, try my Tomato Salad, it's become my signature dish. Watch out for my Roasted Peppers. Looks like a delicious one. I would love to make one and save it for our family dinner. This salad looks great and can be served at various outdoor parties in combination with grilled fish. The preparation of such vegetarian dish will certainly please your guests. However, the combination of vegetables in it is quite unusual for us. I will be very gald to have the recepie like that. It seems to it is the best one.